If you are planning on seeing the Hollywood blockbuster, ‘The Revenant,’ you might be interested in the real story of Hugh Glass. Hugh Glass is a legendary figure to old, whiskered historians who study days gone by. At a time when men on the fringes of society had a place to disappear, Hugh Glass emerged as a figure as big as the lands he traveled. As with so many figures of our past, at times is can be hard to separate the myth of Hugh Glass from his actual life. So what is the real story of Hugh Glass? The real story of Hugh Glass is one of danger, adventure, blood, betrayal, and revenge. With a plot so rich and exciting, it is prime for Hollywood. Mountain men, nomadic Native Americans, the fur trade, grizzly bears, and the endless skies and jagged peaks of the West are the characters and backdrop to this classic story. This tale has no doubt been told countless times around a campfire illuminating the otherwise dark faces of storytellers. Hugh Glass was an adventurous soul, whose past is shrouded in mystery. Some say he was a pirate, some say he lived with Indians, but all agree he left with General William Ashley out of St. Louis in 1823 on an expedition for the fur trade. The trip would be difficult, as the men faced the treacheries of the wild lands in front of them, as well as the resistance of Native nations who knew what these white men were coming for. Glass applied and was hired on quickly as he had all the prerequisites for the job. He was tough, free from obligation, an expert hunter and tracker, and had experience in the unforgiving lands that lay ahead of them. The expedition’s goal was simple: ascend the Missouri River and supply a trading fort that served as the base for the fur empire Ashley was building. On March 7th, 1823, Glass and 100 other fellow adventurers began their endless toil against the currents of the mighty Missouri. By May, they had reached the region of the present border between North and South Dakota. At this point, they reached a village of Arikara Indians where they were attacked and forced to flee by their fierce attackers. During the attack, Hugh Glass was shot through the leg. The injury was a clean pass through and Glass was able to continue traveling showing few signs of his injury. After the Arikara attack, Glass was part of a small detachment led by Andrew Henry ordered overland toward the mouth of the Yellowstone River. While on this portion of the expedition, Hugh Glass was traveling alone down a river bottom choked with brush. Unexpectedly Glass was charged by a grizzly. Old Ephiram, as the mountain men called grizzly bears, snatched Hugh up and flung him about mercilessly. When the other men of the brigade showed up they found Hugh Glass in the dirt, the life oozing from him. Gashes from the grizz ran over his entire body. His head and shoulders had been laid open, his chest was carved up, and his face disfigured almost beyond recognition. Perhaps the most gruesome injury was that to his throat. With each wispy breath, bubbles of blood gurgled from the dying man’s throat through a giant cut. The men of the brigade gathered round to watch Old Hugh breath his last. The problem was, however, that he didn’t die. In fact, after several days had passed, Hugh Glass had not died like he ought to. On the other hand, he wasn’t getting any better with the meager assistance the men could provide. Imagine the scene. A small group of men huddled around a corpse of a man, deep in country of powerful Indian nations that would rub them out if they were detected. They couldn’t fire a shot for hunting purposes or they ran the risk of being discovered, and all for a man who everyone knew would die. After several days of waiting, Henry asked two men to stay with Glass until he either died or was fit for travel. Henry had to offer several months wages before he finally coaxed two volunteers from the group; John Fitzgerald and Jim Bridger. The two men sat with the torn-up man for several days, and in that time, the two men started getting mighty lonesome. Fitzgerald was the first to talk about ditching Glass, heck, he was a dead man anyways. Bridger knew it wasn’t right, but being a young man, only 17 at the time, he eventually gave in to Fitzgerald’s plan. Before they headed off in search of their comrades, the two volunteers had to do something they would regret the rest of their lives. They robbed Hugh Glass of everything. His rifle, his flint, his shoes, and pants. All was stripped from Old Glass and he was deserted and left to die. At this point, the true story of Hugh Glass is left up to the story the man himself told. After being abandoned, Hugh continued to cling to life, and had just enough left in him to regain consciousness. In actuality, Hugh claims to have heard the conversations of the two men who watched over him in period of consciousness. Over the course of several days, Hugh was able to quench his thirst from a nearby stream, and feed his hunger with a few berries from the surrounding brush. Hugh was alive and, best of all, he was getting stronger. Hugh later told people he began to nurse himself back to health and made a vow to return to Fort Kiowa, a fort he calculated at 200 miles across the prairie. He began by crawling on bloody hands and knees out of the river bottom. His pace so slow, and his body so weak, that he could easily see his starting place from where he ended his day. After nearly a week of this snakelike travel, Hugh Glass made it to a rise in the country, and up ahead he saw a sight that would gag most men. A rotting buffalo carcass lay on the prairie in front of him. Not one to be choosy of his food, Glass crawled to the carcass and removed the ribs and extracted the marrow from the bones. This little bit of food gave him the strength to finally get up off the ground and begin crawling, alternating with bouts of walking. Several days later, Glass watched a pack of wolves kill a buffalo calf. Remaining unnoticed, Glass monitored the pack as they gorged on the fresh meat. Once he was certain their bellies were full, he summoned the small reserved of strength he had and chased the swollen-belly wolves off the kill. This is the moment, more than any, that solidified Hugh’s survival. With the strength the calf would bring, he would be able to make his journey. After several days on the prairie Glass was discovered by a band of Sioux warriors. After a quick examination and what sounds like some rough dialogue, Glass was offered assistance by the Natives. He stayed in their camp for several days and was outfitted with a new set of clothes and some food. At this point, the real story of Hugh Glass can be verified by other individuals who were witness to events. It was October 8th, 1823, when Hugh Glass showed up to Fort Kiowa with his new Sioux friends. He quickly purchased a new outfit (guns, flint, knives, etc.) and joined a small force of men who were headed upriver. Only one thing was one Hugh Glass’s mind: revenge. 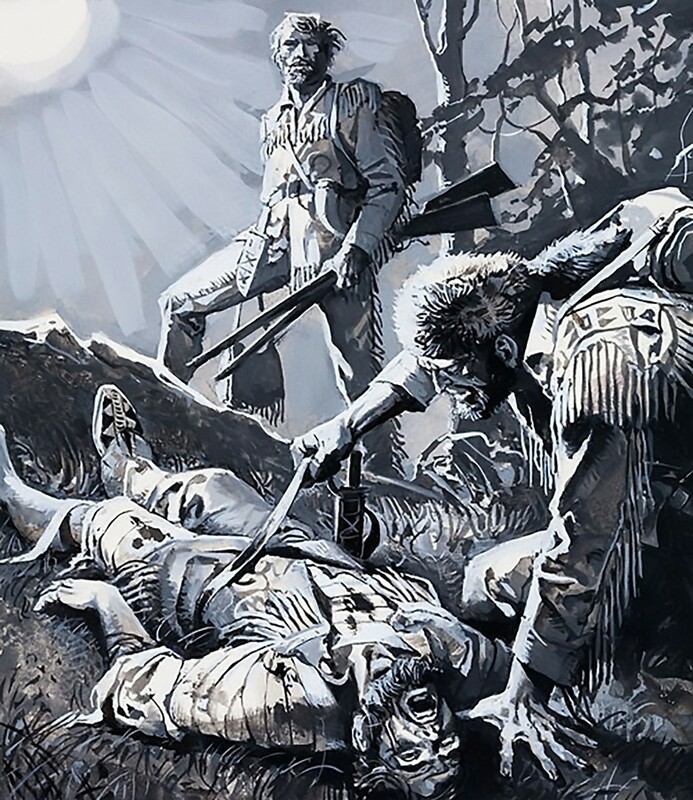 Hugh Glass told people the only fuel he had from the doorstep of death to the fort was the thought of murdering the two men who had left him to die. Not only had they left him, but they had robbed him of all the tools he needed for survival. Several encounters slowed his travel, but Glass finally made the fort around Christmastime. The legend goes that Hugh Glass showed up covered with snow and demanded to be let in the fort. Upon his entrance he announced who he was and his intention to kill the men who had deserted him. Young Jim Bridger was certain it was the ghost of Hugh back to avenge his devilish deeds. Bridger begged for forgiveness and admitted his guilt. In the end, Hugh Glass forgave the young man’s actions, and chalked it up to inexperience. It was a moment Jim Bridger, one of the greatest mountain men to ever live, would never forget. As luck would have it for Hugh Glass, the other man he was chasing, John Fitzgerald, had actually gone back east and given up the fur trade. Once again, Hugh set out across the endless landscape in search of the man he believed to be most responsible for his suffering. Like all great tales of the west, some of the details of Hugh Glass’s great adventure will be debated for ages. Separating the legend from the truth is impossible, and perhaps some of the legend has become the truth. Mountain men love a good story. The real story of Hugh Glass is one of those rare moments in history when a man bent on survival becomes a legend.